Blockchain is the underlying technology of bitcoin, the controversially discussed digital currency. There are, however, numerous blockchain applications beyond bitcoin. A blockchain is a decentralized ledger which mainly records the ownership of assets of all participants in this network. The main characteristic of the technology is that all participants have the same copy of the blockchain stored on their computer. This allows transactions without the need for a trusted third party, such as a bank, an exchange or a notary for the verification of a change in owner­ship. This is necessary in electronic systems because without verification, money or assets could be copied, which undermines the credibility of the system. Blockchain is not an upgrade of the traditional payment and settlement systems, but a completely different way of recording and changing ownership. While in traditional checking accounts money is wired through financial intermediaries in a centralized network, the blockchain is a public, but encrypted, registry of the transactions of all participants. Transactions are recorded in so-called blocks, encoded, and stored there forever. Thereby, old blocks record past transactions, while the newest block records the most recent transactions of all participants. Old blocks and new blocks are connected like a chain, hence the name blockchain. Hoping that the blockchain technology will lower the costs of financial intermediaries for maintaining payment and settlement systems, banks and financial institutions conduct research into the use of this technology (Wirtschaftswoche, 2015). Even the UK government is debating whether and how to use the blockchain technology in public service and regulation (Government Office for Science, 2016). The possibly disruptive element of the technology is not that all historical transactions are stored in blocks and updates are added to the blockchain. Instead, it could be disruptive that the blockchain is not administered by a trusted party that guarantees that changes in ownership are settled and that prevents manipulation or fraud. To ensure the validity of blockchain transactions, each participant has her own copy of the blockchain. If somebody manipulated one or more copies of the blockchain, this would cause these copies to be inconsistent with all other copies. This theoretically makes fraud and double-spending impossible. New blocks in the blockchain are verified by an algorithmic consensus mechanism in form of a competition between different computers, the so-called miners. The first successful miner receives a remuneration, which has previously been collected as a fee from the transacting participants. Once a block is confirmed by consensus, it is added and unalterably stored in the blockchain. There seem to be many applications for the blockchain technology ranging from land and property registry, asset ownership and security trading, international money transfer, the recording of intellectual property rights and copyrights as well as voting. Applying the blockchain would be sensible if it was indeed cheaper, faster, less error-prone and safer than the current payment and settlement systems. Using the example of the payment system, the blockchain promises exactly that: International money transfers could be cheaper and faster if money did not have to be wired from the sender to the receiver, thereby crossing different payment technologies and data formats, which renders this process time-consuming and costly. Payments via this chain of institutions are also vulnerable to cyber-attacks because of the so-called single-point-of-failure. The blockchain is, however, immune to single-point-of-failure because of the many decentralized copies of the ledger, which in theory can be checked for inconsistencies. The blockchain also promises advantages for many other applications, which is why many businesses and institutions currently work on developing their own distributed ledger applications. In case of payment systems, the blockchain has to be open to the general public, but blockchains can also be closed to a group of professionals for other asset classes than money. The technology could be used to digitize securities like bonds or derivatives, and these contracts would be able to make automated payments. Smart copyright contracts could be developed for the music business, which would reduce the costs of collecting royalties. Automated contracts seem possible for the insurance sector as well. Secure digital voting systems might reduce costs for governments and publically listed companies. The more people use the blockchain technology for a single purpose such as a payment system, the larger the blockchain becomes in two dimensions: The transactions of more people have to be stored in the single blocks and more transactions by more people lead to more blocks added to the blockchain per unit time. Using bitcoin as an example, its blockchain has grown exponentially to about 85 times its original size between January 2012 and January 2016. In July 2016, it reached a size of 74,000 MB that have to be stored on each participating computer. However, in recent years, the blockchain's growth rate has slowed down significantly from 6.7 in 2012 to 1.9 in 2015, maybe because the initial euphoria in the new currency has weakened. 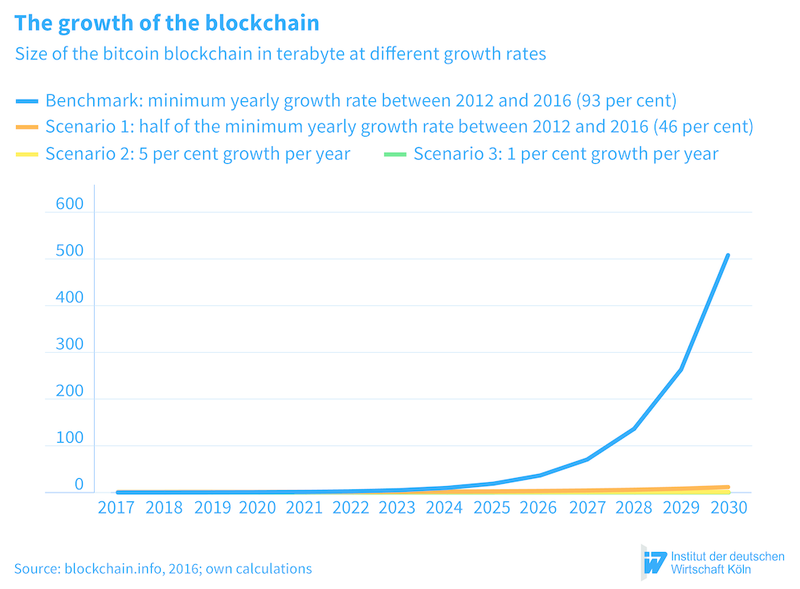 By applying this growth rate as a long-term estimate, it can be expected that the blockchain's size will reach 508.1 TB by the year 2030 (see figure). By today's standards, this represents significant storage space on every user's computer that would be taken up. While the blockchain offers great promise, it is in many ways still uncharted territory. Blockchain applications have to compete with existing technologies which proved to be stable and which are compliant with regulations and money laundering laws. With respect to payments, blockchain applications have to compete with the second generation of the Trans-European Automated Real-Time Gross Settlement Transfer Systems (Target2) which is a common standard for money transfers for 25 European countries. Target2 settles a daily average of 343,729 payments (EZB, 2016), which is 1.7 times the daily average of the number of worldwide bitcoin transactions. With respect to securities trading, blockchain has to compete with Target2-Securities, which is the European standard for securities settlement in central bank money. Although market participants are experimenting with the blockchain technology in order to generate innovative applications, it is far from certain that blockchain will supersede the incumbents. Greater potential for blockchain applications can be expected in developing countries, in which a significant share of the population is unbanked and which lack public ownership records. Since securing property rights and ownership is an are important prerequisite for economic growth, these countries should foster the development of blockchain applications.